cloud in short means "other people's servers" and within the context of the indieweb can also refer to "cloud computing", services which supposedly (though rarely in practice) provide online services that are on-demand, broadly available, elastic, and measured service. See National Institute of Standards and Technology's definition of cloud computing for a more jargon-heavy definition and expansions. Sometimes these on-demand/self-service/elastic/measured cloud services are used for computing building blocks such as storage, computation, and server bandwidth. Examples: Amazon S3, EC2. Akamai. There are a number of indieweb community members who are putting specific effort into moving away from cloud silos and rebuilding their applications on top of cloud (or even just web hosting) building blocks, from providers they can swap in and out and switching between at their desire. As "cloud" is a more recent (and shorter/catchier) term than "server" or "internet" or "virtual host", there are also now commercial services which use "cloud" in the name of their service which do not actually provide cloud computing services. Apple iCloud - neither dynamic nor elastic. 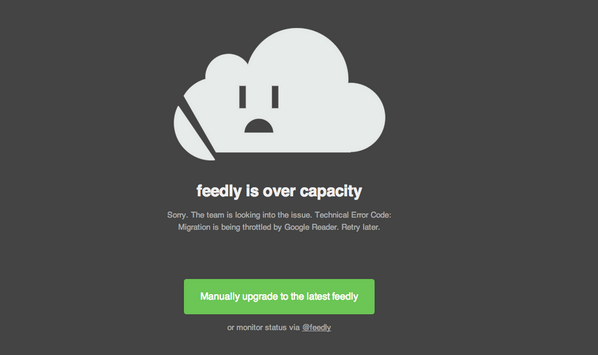 for "feedly is over capacity". This page was last edited on 9 June 2017, at 18:34.